This vest weighed 11 lb (5.0 kg), fit close to the body, and was considered more comfortable. The gun players are WH Murphy and his assistant, of the Protective Garment Corporation of New York. 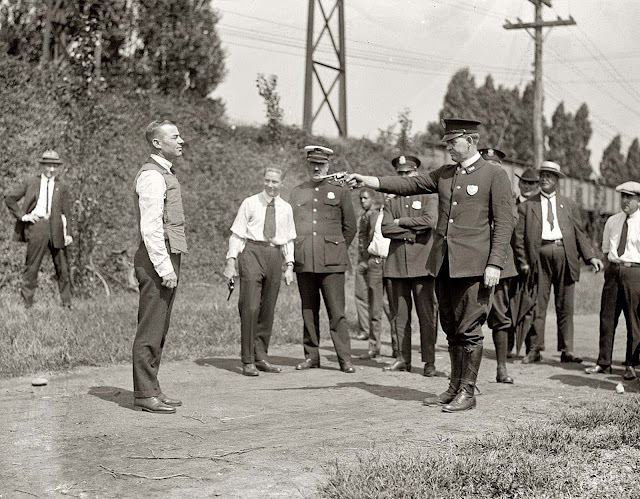 By 1923, the Protective Garment Corporation of New York manufactured a light weight vest for police use and they held a live demonstration in DC. The live demonstration took place at the Washington City police headquarters. They are inventors and salesmen trying to convince the police force that these bulletproof vests work and save lives. The police officers in the background (on the second photo) are all part of the Frederick County Police Department, the gun they are firing is believed to be a S&W Model 10 Revolver. Mr. Murphy stood less than ten feet (3 m) from the firing gun and took two consecutive .38 round slugs straight to the chest, and eye witnesses claims he “didn’t bat an eye” in both cases. Later Murphy gave the deflected .38 bullet to the police officer as a souvenir. This vest weighed 11 lb (5.0 kg), fit close to the body, and was considered more comfortable than the previous types of bulletproof vests. The deputy firing a .38 caliber revolver straight at his chest. The bulletproof vest became an interesting possibility for law enforcement agencies during the 1920s and 30s as the Great Depression saw armed crime levels spike and ‘gangsters’ rise to prominence many of whom were armed with shotguns, large calibre pistols, Thompson sub-machine guns and automatic rifles. Police forces faced with criminals armed with this formidable arsenal were caught on the back foot and looked to vests as a viable method of protecting officers and agents. During the late 1920s through the early 1930s, gunmen from criminal gangs in the United States began wearing less-expensive vests made from thick layers of cotton padding and cloth. 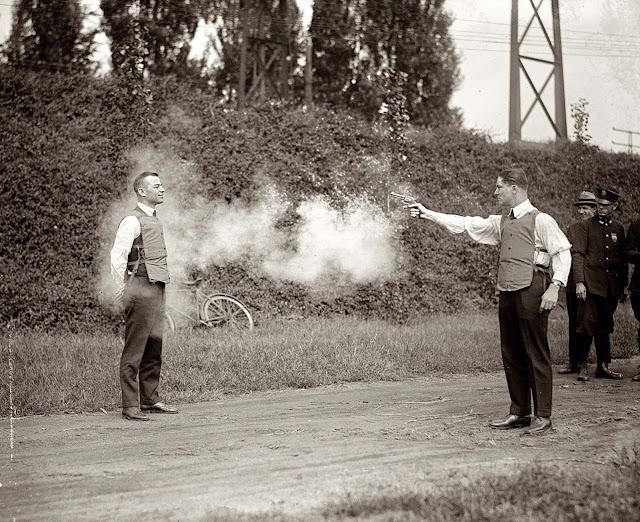 These early vests could absorb the impact of handgun rounds such as .22 Long Rifle, .25 ACP, .32 S&W Long, .32 S&W, .380 ACP, .38 Special and .45 ACP traveling at speeds of up to 300 m/s (980 ft/s). To overcome these vests, law enforcement agents such as the FBI began using the newer and more powerful .38 Super, and later the .357 Magnum cartridge.